Pompeo is planning to visit Pyongyang next month to prepare for a second Kim-Trump summit. Japanese Prime Minister Shinzo Abe has also said this week that he wants to meet with Kim. 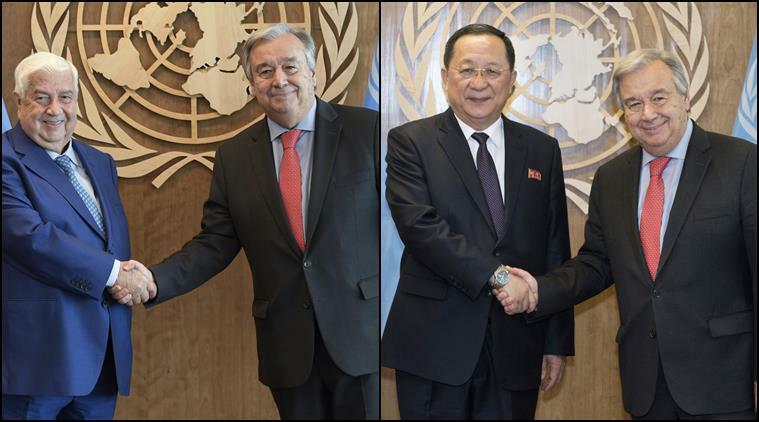 North Korea and Syria, places of international concern that spill trouble beyond national borders, are to appear before the UN General Assembly at a time when both countries could be on the cusp of significant developments. Trump and his secretary of state, Mike Pompeo, are trying to regain momentum more than three months after the Singapore summit with North Korea’s Kim Jong Un, and are pushing for a second meeting in their quest to get Pyongyang to renounce its nuclear ambitions. Syria could be on the verge of emerging from seven years of bloody conflict that included the use of chemical weapons. Still, there is widespread scepticism that Kim will actually relinquish an arsenal that Pyongyang likely sees as the only way to guarantee the Kim dynasty’s continued authoritarian rule. In a wide-ranging news conference at the UN on Wednesday, Trump said he was optimistic Kim wants to get a deal done because of their close ties. In his speech before the Security Council Wednesday, Trump warned Assad against a far-reaching offensive on the northeastern region.